The final two verses of Psalm 5 (vv. 12-13, Hebrew verse numbering) close out the psalm on a very high note. It expresses a climactic crescendo of rejoicing, a six-fold emphasis centering upon Yahweh Himself, and a series of parallels with the first stanza of the psalm (vv. 2-3, Hebrew verse numbering). A striking and memorable analogy completes this psalm that in itself blesses the righteous. Please be aware that the file is large (114 slides) and will take a little time to download. 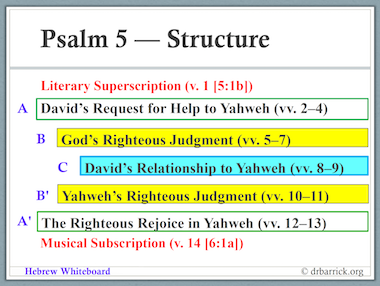 These slides include the discussion and presentation of the psalm’s structure, final summaries verse-by-verse, and a closing slide containing suggested preaching propositions. Click on Hebrew Whiteboard to download Psalm 5 or any of the previous studies of Psalms 1-4 and 120-122. Being a convinced creationist, I enjoy observing the beautiful plants and animals God so wondrously created. iNaturalist provides the opportunity for cataloging those observations and sharing them with other amateur and professional naturalists. "But ask the beasts, and they will teach you; the birds of the heavens, and they will tell you; or speak to the earth and it will teach you . . ." (Job 12:7-8). To allow you to enjoy some of what I have observed and continue to encounter, this link will share my observations recorded on the iNaturalist app.